Q&A: What Causes Jet Lag? Whenever we travel to different time zones, we often experience the frustrating phenomenon known as jet lag. Image courtesy of Getty. After flying halfway around the world, even the most seasoned traveler will succumb to drowsiness, disorientation, and a strong urge to fall asleep in the middle of the day. As we struggle to adjust to new time zones, we cannot help but experience the sensation known as jet lag — the sun in our new location tells us what time of day it is, but our brains often do not process the switch for several days. Normally, the body’s internal clock is programmed to respond to light as a stimulus that keeps us alert and awake. But when the body suddenly shifts to a different time zone, something occurs at the molecular level that prevents light from having its immediate effect. This “something,” recently discovered by a group of researchers at Oxford University, is actually a protein called salt inducible kinase 1, or SIK1. The protein acts as a “molecular brake” on the effect of light in the human body, inhibiting certain genes in our DNA that are activated by light and that help the body adjust to different time zones. The crippling effects of jet lag are often difficult to shake off for days. Researchers at Oxford University have found that these symptoms are due to a protein called SIK1. Image courtesy of Sleeping Well. By reducing SIK1 activity in mice, the research team found that the animals acclimated to time zone changes in only a few hours, whereas untreated mice took six days to adjust. 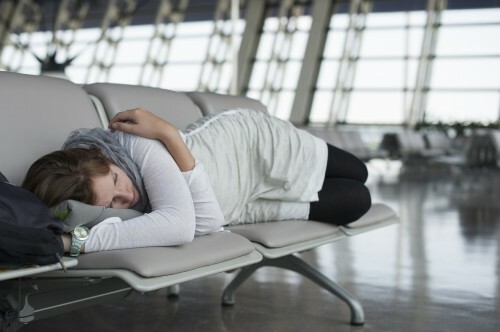 This newfound understanding of the molecular basis behind jet lag may lead to the drugs that could help minimize SIK1’s effect on humans — and maybe help us all enjoy the first few days of travel a bit more.